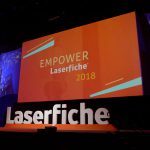 LONG BEACH, CA (Laserfiche)—January 10, 2011—Laserfiche today kicked off its “Empower 2011” Conference with a keynote speech from company Founder and CEO Nien-Ling Wacker celebrating the Laserfiche community’s successes in 2010 and the company’s vision for 2011. A record 1,400 attendees turned out for the event. 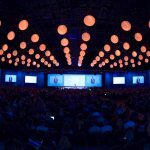 The Conference, held at the Hilton LAX in Los Angeles through January 12, features more than 150 educational sessions on everything from capture strategies to advanced security to integrating Laserfiche with Microsoft SharePoint. HP is the Premier sponsor for the event, and Infolinx is the nametag sponsor. Exhibitors include Bolt Document Management, Cambridge Connections, Canon, CAPSYS, Cerenade, DocuNav Solutions, Epson, EzeScan, FileTek, Fujitsu, LincWare, Millennial Vision, Novusolutions, Objectif Lune, Panasonic, Plustek and United Micro Data.